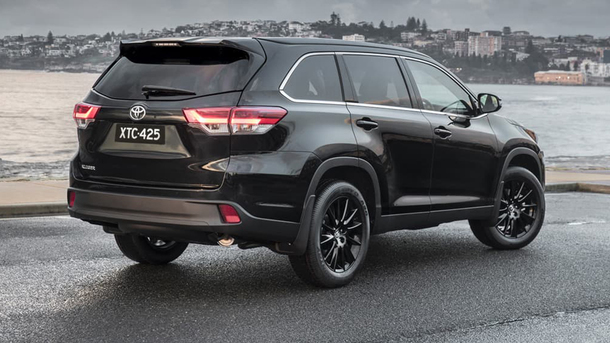 "Toyota has confirmed that black is always in fashion by unveiling a dashing special-edition Kluger dubbed Black Edition." .. and we couldn't agree more! The Black Edition is nothing short of a eye-catcher, with a range of features to help stand out of the crowd. Bold black hues that dial up the attitude - and appeal - of the family-sized seven-seat SUV. Based on the popular mid-grade GXL, with stylish 19-inch gloss-black alloy wheels and 245/55 tyres, replacing standard 18-inch rims. Back touches thrive through the handy roof rails, a large upper grille that straddles a body-coloured bumper, smoked backplates for the headlights and lower side mouldings. The two-wheel drive and all-wheel drive is now trending in Toyota dealership at a modest $1,020 premium1. Prices are $55,9701 (2WD) and $59,9701 (AWD). Powered by 3.5-litre V6 petrol engine with direct-injection technology for brisk acceleration and overtaking. 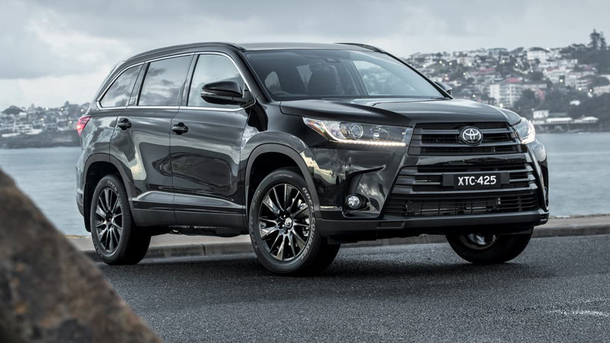 Sean Hanley (Toyota Australia vice president sales and marketing) said "the Kluger Black Edition will enhance the driving experience through its unique styling and design touches. "Toyota Kluger customers now have another opportunity to distinguish themselves beyond the contemporary design, seven-seat space and handling performance that is synonymous with every Kluger,"
1 Recommended retail price provided for general media release purposes only. Excludes dealer delivery, statutory charges and metallic paint. 2 Achieved in test conditions for comparison purposes only. Actual fuel consumption varies depending on driving conditions/style, vehicle condition, load and options/accessories fitted. Source: ADR 81/02 combined cycle (litres/100km). 3 Driver assist feature. Only operates under certain conditions. Check your Owner's Manual for explanation of limitations. Please drive safely. 4 Coverage dependent on vehicle location. 5 Max price quoted is model specific. Applies to standard scheduled logbook servicing (normal operating conditions) for 3 years / 60,000km (whichever occurs first) up to a max. of 6 services. Excludes government and rental vehicles. For details see your Toyota dealer or visit toyota.com.au/advantage.